An iconic London landmark is to close after 75 years. Walthamstow stadium in east London, famous for its greyhound racing track, will be sold to property developers. Directors say falling profits and attendances have forced them to sell up. Racing will continue until August this year. Famed for its pink and green neon-lit frontage, the stadium has been one of the capital's most recognised landmarks. Charles Chandler, whose family have owned the course since it opened in 1933, said: "The company's operations have become unsustainable." Everyone with an interest in racing will miss the unique sense of style with which Walthamstow Stadium has hosted greyhound racing. Staff and trainers were informed of the news over the weekend. Mr Chandler said most of the greyhounds currently racing at the stadium would be accommodated at other racecourses. The east London site has long been a target for developers as it is close to the London 2012 Olympic Stadium site. British Greyhound Racing Board Chairman, Lord Lipsey, said: "Everyone with an interest in greyhound racing will miss the unique sense of style with which Walthamstow Stadium has hosted greyhound racing." Racing fan and greyhound owner Graham Goodkind started a 'Save the Stow' campaign last year and gained more than 3,000 petitions protesting the sale. He told BBC London: "This is very sad and a massive loss for London. I've been going to the stadium as a dog owner and a racing fan for years. "It's always sad as a Londoner to see these things go out of existence." Animal rights activists have long campaigned for the closure of the stadium. Over the past 10 years, at least 20 licensed and independent stadiums have closed for good. 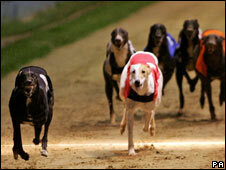 There are just two dog race tracks left in the capital, Wimbledon and Romford.